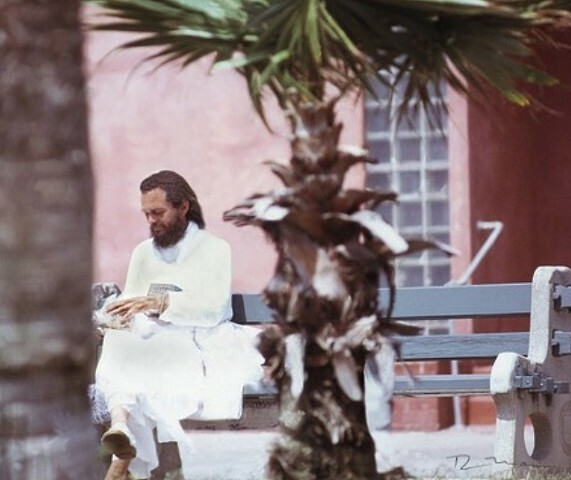 Dressed in a white full-length indian robe at Venice Beach Ca., this new local resident "Baba" photographed here, arrived in Venice during 1975 and I photographed him agaIn thirty-five years later at: . . . rvmann.com/artwork/2566009-Chicago-Baba? I respected his wishes and always considered him as an iconic being for peace. I knew that when I would visually see him and symbolize by his presence (similar to the good luck feeling after viewing a dolphin at sea) I then realized that The World Wasn’t Going To Hell In A Hand Basket After All and least there was some room for tranquility and redemption. I used to see him come by my vending space where I sold local photographs and art but refrained from interrupted his concentration. One day while strolling down the Boardwalk, I walked by were he was perched at his usual bench. He looked up and we smiled simultaneously while I was thinking of his unusual appearance. Not wishing to break his silence and possibly making him uncomfortable, I courteously said “Hello.” Surprisingly, he returned the greeting and said “Hello” in return.” I was compelled to converse with him. While briefly chatting I noticed that he had an east coast accident. I asked him where he was from originally, and he replied, "Chicago." So I re-nicknamed him “Chicago Baba.” Not as a professed guru, but his mere presence would always project an aura of self-comfort and peacefulness. I've always thought that |Chicago Baba| had a subconsciously profound influence on my creating my “Dreamer” image. rvmann.com/artwork/2505319_Dreamer_Mult? I thought I would never see him again until one day while driving from a distant location, during traffic, I briefly saw him riding his cruiser bicycle. Anxiously, I whipped out my handy point and click camera, but unfortunately the photo opportunity became untimely. Once agian while leaving the Boardwalk area in my car a few weeks later, I spotted him walking his bike. This time I attracted his attention and gestured to join me. We had a lengthy chat as we reminisced about my selling photography on the Boardwalk. Speech-fully he revealed that he was of an Italian-Russian-Jewish descent and that his birth name was Shanda Reiner. He said he was leaving Venice presently to travel to India as he was summoned by his chosen religious leader to join him there. I gave him my business card and requested that he to keep in touch. We wished each other well and parted separate ways.